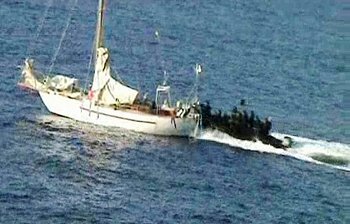 Somali Pirates: Part of a Maritime Jihadi Strategy? Most of the media discussion about piracy in the Gulf of Aden has drifted understandably towards the sensational part of the story — how are the pirates able to roam the ocean? Is paying them ransom a better option than to engage them militarily? Last but not least, will a military intervention against the pirates worsen the situation; will it lead to a massive escalation in Somalia and a Vietnam-like quagmire for many years to come? The armed bands on the waters still roaming the seas of Aden and the Indian Ocean across from Somalia and Kenya are not impressed with the dozens of naval units dispatched by powerful navies from around the world. What is behind this piracy phenomenon, what lays ahead if the international community intervenes, and what could develop in that region if the latter is late to intervene or doesn't meet the challenge? It appears the strategic challenge is even bigger than the mere piracy. Indeed the strategy now contemplated by regional powers could become a major military debacle. Here is why: these so-called Somali pirates are strategically different from their historical predecessors in the Caribbean, or from their contemporary colleagues in archipelagoes around the world. They aren't a vast collection of individual thugs, acting as bands replicating what successful sea gangs have accomplished for centuries before them. They are too many, operating from extremely long shores, all using similar methods, and are backed from hinterland forces. They may seem like pirates as they seize ships and negotiate for the ransom. But these water thugs actually belong to a wider chess game. The grand ensemble of the army of little boats is in fact part of a regional Jihadi apparatus being deployed in the Horn of Africa and beyond. The Jihadi grand circle building in the region is not limited to the pirates but involves hostile forces from the mid-Red Sea to East Africa. The Somali pirates are merely one facet of this grand circle. Ironically, the term used in Arabic (and now in Arabic media) to depict the Somali pirates is "Qursaan," which derives from corsairs, the swashbuckling French privateers from a bygone era. A view of the operations map of these Somali Qursaan leaves little doubt that the end aim is to create a vast zone of insecurity stretching from East Africa to the Red Sea. A closer look allows strategists to easily realize that these are the maritime passages from the oil-rich Gulf to the Mediterranean via the Suez Canal, and also parts of East Africa, the most economic alternative routes via Cape Town. So, above and beyond the globally low (even if locally lucrative) revenues that these operations bring to their little pirates, the greater Qursaan operation is of regional-international dimension. It is about holding these passages hostage, thereby bringing global negotiation. This is nothing more than a maritime Jihad striking at the Western/international lifeline on high seas to bring about a change in balance of power. If the West (with other democracies or powers) decides to engage the Qursaan on high seas only, there will be more waves of piracy action, and revenge actions will gradually take place against the countries whose vessels conducted the military interdictions. When such escalation takes place the options are only two — either the powers suspend the operations and negotiate with the pirates/corsairs or take offensive against their ports of launching, that is, on Somali soil. If the United States and its allies drop the naval campaign and assign diplomats to negotiate the matter, the Qursaan will grow in numbers and influence. Eventually their outreach will close the waters between the Arabian Peninsula and Africa. But if the international coalition (which yet has to take shape) decides to take on the attackers' points of origins, this will lead to a massive campaign along the Somali-Kenyan coastlines, forcing actions to be taken against large ports, many smaller ports and eventually beachheads to establish security enclaves. Such a military projection would re-create a multinational force to perform the missions, reprisal operations and eventually inland deployment deeper and deeper inside Somalia. That's precisely what the Jihadists are looking for — brigades of international forces landing in that country, Kuffar (infidels) in nature, so that the Shabab al Jihad and other remnants of the Mahakam have the honor of fighting. The so-called pirates are being used by land-based forces to drag the enemy into a wider war in the region, with all probabilities and possibilities open. To each decision made by the West and its allies, a counter plan will be applied. These are the types of complex threats that twenty-first century terror forces will develop to upset the balance of power. For, by challenging a previously stable area of transportation and commerce, the forces behind the Qursaan will be scoring a major victory. If the foe negotiates, they win, and in their view also, if the foe engages militarily, the Jihadists win too. Indeed, if full-scale war erupts around Somalia, the forces engaged in such a campaign would involve many navies in the area. Two months ago, Eritrea and the Iranian regime signed an agreement granting naval facilities to the Khomeinist military ships to use the country's ports and eventually build a base on the Red Sea. Last month, reports signaled an alignment of military intelligence between the Sudanese and Iranian regimes and Hezbollah's networks in the region. In our media debate we are still at the stage of sensationalist stories and footage of modern day piracy. In the war rooms of the other side, the Qursaan are probably a tip of an Islamic iceberg moving slowly towards one of the most sensitive regions of the world. The gap between our debate and strategic realities has always been at the core of failures. This time we should catch up before we fall behind and stumble terribly. Dr. Walid Phares is the author of "The Confrontation: Winning the War against Future Jihad." He is the director of the Future Terrorism Project at the Foundation for Defense of Democracies and a visiting scholar at the European Foundation for Democracy.